The family of Kesha L. Jordan created this Life Tributes page to make it easy to share your memories. 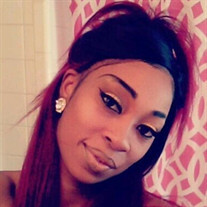 Kesha L. Jordan, 32, passed away Saturday, December 29, 2018. Send flowers to the Jordan's family. © 2019 A D Porter & Sons Funeral Home. All Rights Reserved - Made with love by funeralOne.